Atlantic’s Colorfalls are a perfect fit for formal retaining walls and pond-free applications. Colorfalls adds a breathtaking new dimension to a water feature – waterfalls with shimmering details in white, red or blue hues. Automatic color-changing weirs can be controlled remotely and synchronized with hardscape lighting to create a stunning atmosphere where sophiostication and drama are desired. You’ll be able to enjoy the beauty of your water feature day or night. 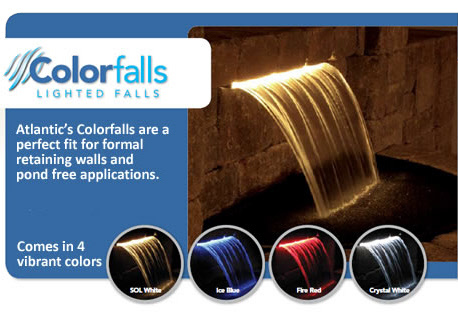 The newest Colorfalls™ models continue to lead the industry in appearance and functionality. Available in solid colors, color changing, and now in four different sizes, Colorfalls will add a simple, elegant beauty to your outdoor space, day and night. The Atlantic Colorfalls System is what sets us apart from the rest. Designed not just as a stand-alone item, but as a centerpiece for beautiful outdoor living installations. Create brilliant effects with Atlantic’s Color Changing Colorfalls which have 16 color modes. The new weir design allows more water to come through, adding body and extra color to your falls, while the new light bar offers 16 different color options. A remote control module is included with all C..
Atlantic’s original Colorfalls brought the Formal Spillway to the Backyard Oasis, and they’re still the perfect fit for all your vertical wall applications. Whether your wall is brick or block, natural stone or ceramic tile, you can add the beauty of shimmering brilliance in red, white or bl.. These are the authentic Color Changing LED light strips that fit in the ColorFalls™ weirs from Atlantic® and can also be used in other weirs and waterfall applications or added as a special effect lighting for ponds or water features or landscaping. Each color changing weir comes with remote..
For formal water features and commercial installations the Brilliant Wonders PVC sheer cascade weirs are the best choice for durability and ease of installation. The color-changing LED weir can be controlled with a versatile sync-control unit. Heavy duty white PVC weir with 6" lip creates sh..